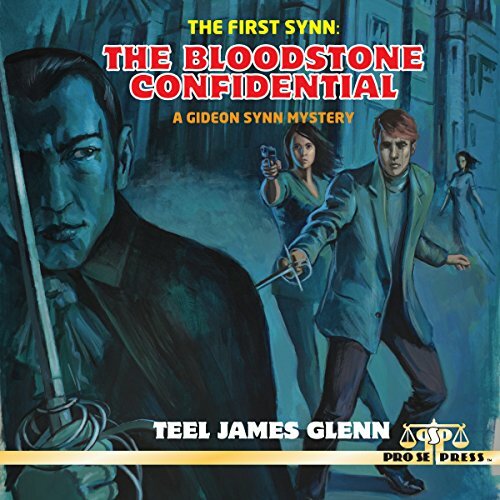 Pro Se Productions gladly commits THE FIRST SYNN: THE BLOODSTONE CONFIDENTIAL, the first of a series of supernatural pulp thrillers by noted award winning author Teel James Glenn, to audio! This first volume is now available as a top quality audio book produced by Radio Archives. Complete with chills and thrills harkening back to the classic Pulps, THE FIRST SYNN introduces the first sibling duo in Pulp history, ready to take on whatever horror flies their way! Years ago Gideon Synn tried to save Faith Bloodstone from a deadly family curse in upstate New York. He failed and Faith died at the hands of a mysterious blood drinking fiend. Synn ran from his failure and became a world traveler, joining the French Foreign Legion and eventually becoming a mercenary in China. Now, years later he has opened a security firm with his sister Kathy. Charity Bloodstone, Faith’s younger sister, comes to him for help against the same curse—the supposed vampire ghost of her ancestor, Justice Bloodstone! According to legend, Charity has only one week to live! Several people have been killed by what appears to be the undead Justice in ways that suggest a supernatural cause. The Synn siblings are drawn into a whirlwind of terror and evil as the mystery of the vampire murders comes closer and closer to fulfilling the curse. Has Gideon found love with Charity only to lose her to dark forces? Who are the armed thugs that have attacked the siblings? Can Kathy Synn keep her brother out of trouble long enough to solve the mystery of the Bloodstone Confidential? This thrilling audio book is also available on Audible and Itunes. THE FIRST SYNN: THE BLOODSTONE CONFIDENTIAL is available in print and digital formats at Amazon and www.prose-press.com.